Make the Sign of the Cross and say - In the name of the Father, and of the Son and of the Holy Spirit. Amen. 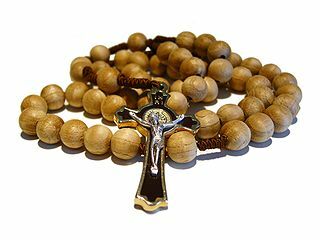 Say three Hail Marys on each of the next three beads asking for an increase in the virtues of faith, hope and charity. For each of the five decades, announce the Mystery, then say the Our Father on the large bead. In closing, make the Sign of the Cross again and pray - In the name of the Father, and of the Son and of the Holy Spirit. Amen. You may also pray additional devotional prayers if you wish. O my Jesus, forgive us our sins, save us from the fires of hell,lead all souls to Heaven, especially those who have most need of your mercy. One Our Father, one Hail Mary, and one Glory Be.